This is my new favorite charger box, the Anker Astro E1. Instead of one bigger battery. I’ll get a couple of these. They’re much more portable, fit right in my pocket and I can always keep one charged. My family was on vacation in Maui a few months ago, the kids were on their phones the entire time and batteries weren’t lasting long. 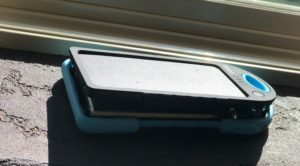 My nephew had usb charger box he carried around everywhere he went and the kids were fighting over who got to use the $100 Mophie that didn’t last very long with two iPhones plugged into it. I knew I could find a better/cheaper charger box so that night I got back to my hotel room I started researching to find the best one for our family. I consider myself an expert (ok mild addict) Amazon Prime user. I carefully read the reviews and Q&As for each of the top products before selecting one to buy. I ended up buying 4, here are the reviews. Ummm, in short, no. I really wanted it to work, but solar tech isn’t there yet for these. The panel is just too small. 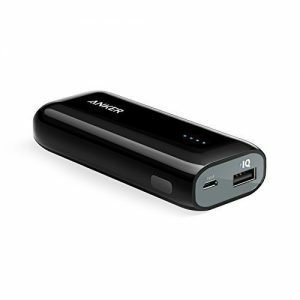 The Innoo Tech self rated in at 5000 mAh and would only change an iPhone 6 about one full charge. To give you an idea of capacity, the battery in the iPhone is rated by Apple as 1810 mAh. 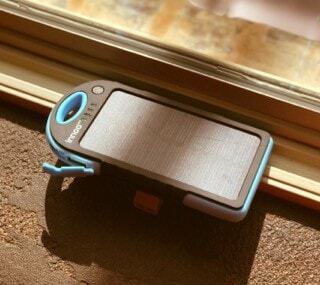 When the Innoo Tech was 100% dead I left it in the window sill of the sunniest spot in my house for weeks. Seriously at least 3 weeks. The highest charge it was ever able to get was around what seemed to be about 40%. If you’re stranded out in the desert it might be better than nothing, but the usb solar charger boxes for all real purposes are a gimmick at best. None of the name brand charger boxes have the solar panels, that’s probably the reason. I travel frequently and I wanted to find how long I could power my phone without plugging it into a wall. So I charged the RAVPower 16750, made sure it was at 100%, and then I ran my iPhone 7 all the way down till it died. 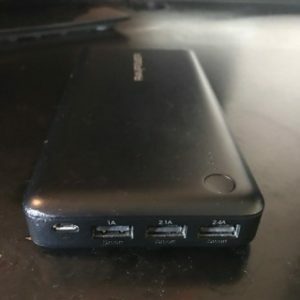 I then used the portable battery, and only the portable battery to charge my phone, only plugging it into my phone when my phone was under 10%. I was able to run my phone for just over 6 full days. Which is pretty good. I also made sure I didn’t do anything out of the my ordinary routine. Checking as often as I normally would, I even spent 2 hours one day working off my phone in a local coffee shop via tethering. I also bought two other RAVPower charger boxes, a massive 26800 and a 22000. You can’t tell from these two pictures but both of these are much larger and heavier than the RAVPower 16750. I did the same experiment with the 26800 thinking surely I’d get about 9 days. But it ended up coming in about 7 full days of power. This might not have been a peer-reviewed scientific study but hey I did my best. 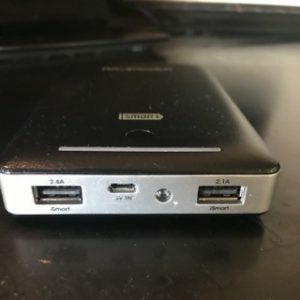 If you travel a lot or just find yourself without a charger when you want one frequently, you might look at picking one up. After having laid out in my window for too long apparently, the battery in the InnoTech ending up bubbling up and breaking the case open. Eventually, it might explode if left in the sun to charge. I tossed it in the trash.